CSIRO scientists have had a breakthrough which will allow for the world’s strongest material to become more commercially viable thanks to soybeans. The world’s strongest material, graphene, is a thin carbon material with high conductivity, so it can be used in small electronics, computers, solar panels and many other devices. Until now, using graphene has been hard for manufacturers because of its high cost. Traditionally it is grown in a highly-controlled environment with explosive compressed grasses, requiring long hours of operation at high temperatures and extensive vacuum processing. CSIRO scientists have however now developed “GraphAir”, technology which eliminates the need for such a highly controlled environment. 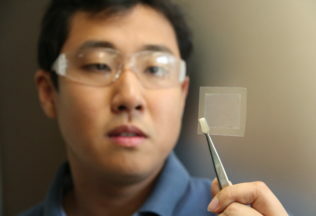 GraphAir transforms soybean oil, into graphene films in a single step. “Our GraphAir technology results in good and transformable graphene properties, comparable to graphene made by conventional methods,” said CSIRO scientist and co-author of the study behind GraphAir, Dr Dong Han Seo. With heat, soybean oil breaks into a range of carbon building units that are essential for creating graphene. The study also included testing other types of oil, including those left from cooking and barbecues. The CSIRO says it is now looking for an industry partner to help find new uses for its graphene. Researchers from The University of Sydney, University of Technology Sydney and The Queensland University of Technology contributed to the work involved in developing the new graphene.